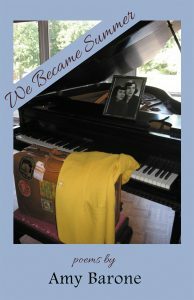 We Became Summer reads like a coming-of-age memoir of a young woman finding herself through time, travel, loss and reflection. This is Barone’s first full-length poetry collection since having two chapbooks published, Kamikaze Dance (Finishing Line Press, 2014) and Views from the Driveway (Foothills Publishing, 2008), as well as individual poems in numerous anthologies and literary journals. Before reading this new collection, I was drawn in by three things: the title; the cover’s time-travel collage; and the section headings (Heat, Light, Sounds, Home, Breeze). Who would not be curious to know more, to follow Barone into – and through – her carefully shaped offering of sensation, feeling, and movement? Barone has managed to condense a full life in these few pages, from the coming-of-age experiences of first love through the sensuality of adventure to the final reconciliation of aloneness, both hers and ours. Her knack for the short poem is evident throughout the collection. Some of those in which she memorializes or addresses individual musicians might be less accessible to a reader unfamiliar with their music. However, her appreciation of varied music – its continuo to her life, if you will – is abundantly clear. “I’m willing to caress another raging ego. he has a feathery touch.” (46). Only later does she realize “We had all that we wanted … Unaware we wanted for nothing … We want all that we had.” (65). “Priorities sit on a constantly revolving Lazy Susan./I didn’t realize I had the perfect life.” (67). She gives us the essence of that perfect life in concise moments and images on the page. “Traditions ebb; simple joys lose poignancy. Variety is certainly the spice of this collection – from riffs on musicians and their music, to wordplay in ‘Orange is my New Black,’ to multiple moments from an Italy seen through a young woman’s eyes. For its poetic succinctness and emotional universality, I perhaps like ‘Last Words’ best of all. We Became Summer warrants more than a casual read, as the density of each piece carries far more weight than its space on the page suggests. Sarah W. Bartlett’s Slow-Blooming Gratitudes was a New Women’s Voices Chapbook finalist in 2017 and her second chapbook with Finishing Line Press. Widely published in literary journals and anthologies, she mentors incarcerated women to find their voice through writing for personal growth and change.